Welcome to Not Me! Monday! As always, this was created by MckMama, head on over to her blog to see what she and everyone else have NOT been doing this week! This week, one of my twins did NOT leave my bedroom door open, allowing baby Drew access to my room. And Drew most certainly did NOT decide my lamp needed a little re-vamp. 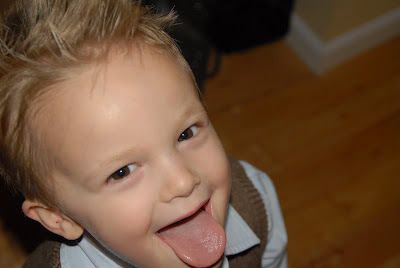 He is a wonderful baby and is NOT following in the footsteps of his destructive older brothers. At Emma's school Christmas program, my child was NOT the one continuously tugging on the ponytail of the little girl in front of her (completely ruining the child's hair) no matter how many times the child asked her to stop. NOPE, my darling daughter would NEVER cause a disturbance like that! There was most certainly NOT a small part of me that was hoping the girl would haul off and whack her, so that she would knock it off. I was glad that we are friends with the child's family, and that the parents were gracious and understanding. I did NOT make her apologize to the girl later. By the way, did you notice something there? My daughter goes to public school. And it was a Christmas program. The PTO did a volunteer program for the families that wanted to have a old-fashioned Christmas program, and it was awesome. I did NOT tear up when the kids and the audience all sang Silent Night together, in a public school. I do NOT love the school my child attends. My darling twins did NOT turn three this weekend. NOPE, they are NOT growing up way to fast! At the party, my entire family was NOT thrilled and excited at the fact that I made the boys their own little cakes to blow out their candles and eat, leaving the cakes to be served to the rest of the group spit-free. We had our first of seven family Christmas events yesterday. 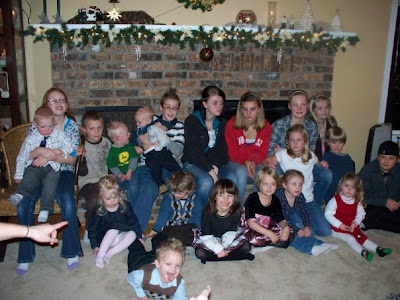 It was most certainly NOT my child that was creating the disturbance while we were attempting to take a group picture of all the cousins at yesterday's gathering. NOPE, my twins have just left the age of two and are not proving correct the theory that it is actually the terrible threes, not the terrible twos. They are very well behaved and would NEVER jump out of line and stick their tongue out at the camera(s), allowing my sister-in-law to get a picture of the group with crazy Grant and two adult's fingers pointing him back into place. My darling sister-in-law Holly, would NEVER put the above picture on Facebook for all to see. She would NOT post a picture of my child behaving badly knowing full well I would blog the picture as well and not be upset at all risking my potential embarrassment. Nope, NOT her! Grant was NOT having a bit of a crazy day all day at the party. He did NOT ask for Chocolate cake for breakfast this morning, and thinking of his "performance" yesterday, I did NOT laugh out loud at the thought, then pour him a big cup of high-fiber low-sugar cereal instead. 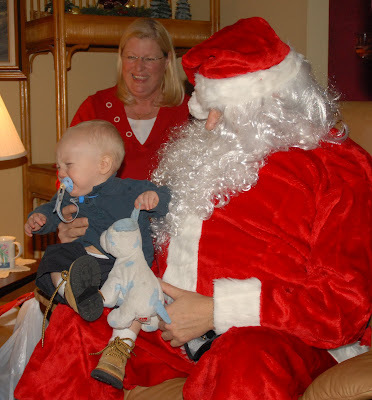 Santa did NOT make an appearance at our family gathering, and Marty we did not decide that Drew should sit on Santa's lap, potentially scarring him from loving the man in the big red suit for life. 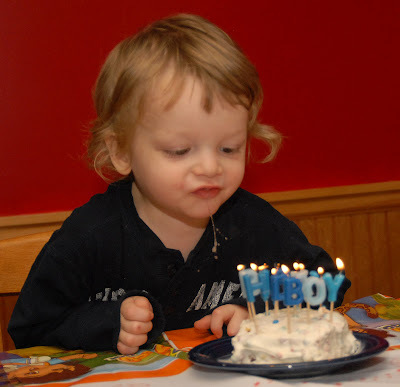 Nice action shot of Ben spitting out, I mean BLOWING out the candles! You can see every drop so clearly. These are hilarious. I have to follow you now. Very smart on the spit-free cake idea. I may have to try that. I saw that exact lamp at Goodwill yesterday. minus the huge rip that is...so not exactly. But yah, in case you were wanting to replace it.